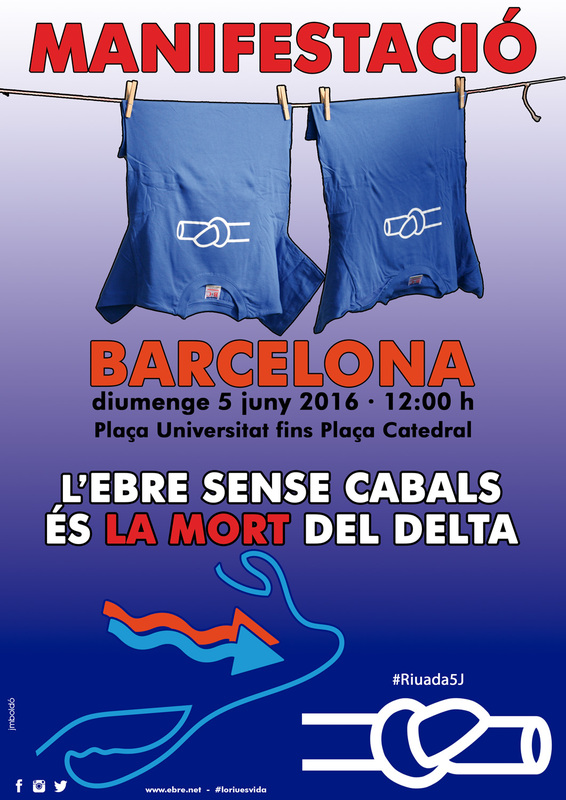 Why are we demonstrating in Barcelona on 5 June 2016? The demonstration against the new Ebro River Basin Management Plan on June 5 is an action with an eye on Europe. We have chosen this day, World Environment Day, to draw attention to our plight once more before we present a new Complaint to the European Commission regarding the effects this Plan would have on the lower Ebro and its river Delta. Since the Spanish Government began — late, as usual — to prepare the new River Basin Plans (following the EU’s Water Framework Directive), we have tried to participate by bringing information, rationale, and criticisms where necessary, but it’s been in vain. All our input, and that of over 50 other groups which make up the Cuenca Azul collective, has been ignored. The Spanish Government knew before they began which results and objectives the Ebro Plan would have—they had to “prove” that it is a river with “excess water flow”, and so be able to reserve a huge amount of water for future inter-basin water transfers (even though these may be called “sales between users via water banks”), and to approve a minimum ecological flow level for the lower stretch of the river by simply noting what was left over after these deceitful calculations. Committee several times in defence of our position. On receiving the draft version of the Plan, the European Commission issued a list of recommended changes which the Spanish government has also ignored. Finally, the Petitions Committee decided to send a group of MEPs here to research the topic in situ and to speak to the people affected in the Delta on 8 February this year. They met with fishermen, rice farmers, shellfish farmers, members of the PDE (Ebro defence campaign group), and scientists. 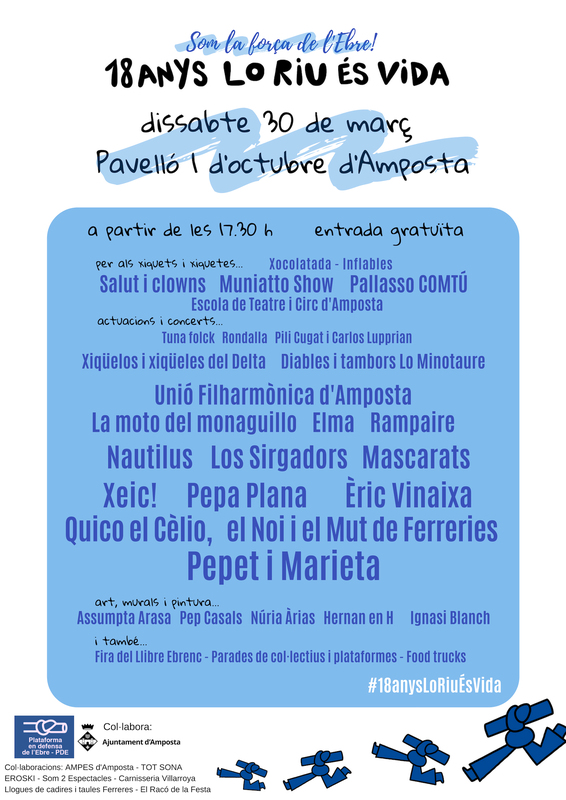 The day before they came – 7 February – we organized a huge and festive march in Amposta (Ebro Delta) with 50,000 people. The largest demonstration ever in Catalonia outside of the capital city of Barcelona. The report that they are now preparing is not a legally binding text but it will offer proposals and arguments to the European Commission when this body has to make decisions about this new irrational and unsustainable plan. Therefore, coming back to the present, it’s very important that we make ourselves heard very clearly on the streets of Barcelona this Sunday so that they can hear us in Brussels – the echo of our festive protest march will still be sounding loud when we present our official Complaint to the EC. about this new Plan, and everything that will come after it. Let’s have a massive demonstration in favour of the environment, the likes of which has never before been seen in Europe. A huge demonstration calling on the European Commission to ensure EU Directives are followed in the Ebro case. Given the Spanish State’s previous background regarding environmental legislation, and the risk the Ebro and its Delta are facing, we call for a direct intervention of the Commission in the Ebro river plan before it is too late! The river Ebro winds its way through Spain and Catalonia for 930 km before flowing into the sea at the Ebro Delta. This river delta was created by the sediments the river has deposited there over many centuries. The Ebro Delta is a spectacular, fragile place – a unique set of ecosystems hosting a profusion of bird species, but also home to tens of thousands of citizens whose way of life depends on the river. However, water is a valuable resource. Different Spanish governments have made several attempts to carry out large scale water transfers from the Ebro over recent decades, to divert the Ebro’s water for mass tourism, unsustainable irrigation projects, and the growth of huge metropolises along the Mediterranean coast. These projects would only accelerate the problems the Delta is already suffering from. Seeing their livelihoods in danger, local citizens have campaigned for decades to protect the Ebro. Faced with the major water transfer plan of 2000, we set up the Plataforma en Defensa de l’Ebre (PDE) campaign group to bring together all our energies in a struggle which we eventually won when the European Commission refused to fund the project, and the next government repealed the plan. The threats to the Ebro Delta never go away, though. The present Spanish government has presented the new Ebro Basin management plan (as required by European Directives), which should assess the current situation of the river and set out the next five years’ planning. However, this plan ignores all the recommendations of the European Commission (EC) and basically prepares the way for yet another attempt to transfer water out of the Ebro basin. In this Ebro version of the film Groundhog Day, the government once again ignores the needs of the Ebro Delta (its ecosystems and its people), and refuses to set a sufficiently high value for the minimum environmental flow of the river. The PDE has denounced this situation in Brussels, presenting a petition to the European Parliament and sending independent scientific opinions to the EC. On 7 February 2016 over 50,000 people demonstrated in the Delta, rallying in favour of EU legislation and the defence of the river Ebro and Delta. We call on the European Commission to enforce its own Directives and intervene directly in the case of the Ebro Plan before it is too late to save the Delta. Why we demonstrated in Barcelona on 30th May 2010. This huge protest march planned in Barcelona to protect the river Ebro and its eco-systems, and to demand the Spanish government respect European legislation on environmental questions. 1. The Spanish government has to draw up a new Hydrological Plan for the Ebro basin, following EU legislation as laid down in the Water Framework Directive, to bring water and river management into the 21st century. They are currently 18 months behind schedule with this Plan. 2. One of the chief aims of this Plan is to allocate a “minimum” environmental flow for the Ebro. Technicians and scientists have calculated this flow but it seems like the political authorities are not taking their figures into account, and seem set on agreeing a “political” flow. This would have no scientific reasoning but would instead allow for the Ebro’s water to be shared out among its different users, leading to a precarious future for the river and its delta. 3. While we await this new Plan, 300,000 new hectares of irrigation projects are underway along the Ebro basin, alongside other irrational uses which will have devastating effects on the river. 4. Two major works being carried out are the so-called “irrigation canals”, Segarra/Garrigues and Xerta/Senia, which are nothing more than the means to transfer water to the urban areas of Barcelona and Valencia. 5. If these actions are allowed to continue, it will be impossible to correctly apply the Water Framework Directive in the Ebro basin. The protection and future of the Ebro and its Delta will be at risk. 6. Behind these activities there is an underlying policy of promoting the growth of huge urban areas, and using rural areas, like the Ebro, as stores of natural resources to be used when necessary, but with obvious limitations and restrictions on their development. This leads to an imbalance in the socio-economic situation of Catalonia and Spain. 7. This problem is not merely local. The river Ebro forms part of Catalonia and the European Union, and negative effects on the river are negative for Europe’s environment and natural heritage. We need European citizens and political institutions to insist on protection measures for the Ebro, starting with a respectful river flow of both water and sediments, essential for the future of the delta. The EU must insist its nature Directives are applied correctly. 8.To fight against the powerful political-economic interests which are responsible for the current problem we need European citizens to make themselves heard. For this reason tens of thousands of people will march in Barcelona on 30th May. Join us! The River Ebro and its Delta form one of the most important, and delicate, natural environments in Catalonia and Spain. The Delta is one of the most important natural parks in Europe. The Plataforma en Defensa de l’Ebre (PDE) is a group of volunteers campaigning to protect the river Ebro, its eco-systems and, consequently, the livelihood of many people who live on and around the river. One of the chief threats to the Ebro over the years has been, and still is, the idea of channelling large amounts of water out of the river and “transferring” it to other areas of Catalonia and Spain. The river Ebro and the ecosystems of the delta and accompanying coastline are already in a precarious state and cannot withstand a further loss of water supply. Local people have been fighting to defend the river against various government transfer projects ever since the 1970s. In 90s we set up the association Coordinadora Anti-transvasament and in the year 2000 we set up the informal organization, the PDE, involving many people from all walks of life living in the Lower Ebro region who come together in weekly meetings to assess action methods to help in the campaign to protect the Ebro and its lands. Apart from problems with quantity, the river also suffers from quality questions due to industrial waste, agricultural run-offs, and salinisation. As the Ebro heads out to the Delta, the sea comes further and further upstream to meet it thanks to its reduced flow, with all the problems this causes for the river eco-systems. The Delta itself and the littoral areas surrounding it are in an extremely precarious position too, with the Delta suffering from subsidence, regression, and salinisation. The area around the river, the Terres de l’Ebre, has the lowest income per capita in Catalonia and serious socio-economic problems. The river is the chief natural resource in this area so apart from direct effects on people such as local rice farmers, shell-fish farmers, fishermen, eco-tourism firms and so on, any negative effects on the river will also worsen our situation. Our current focus is on preventing water transfers from the Ebro to Barcelona and southwards via two canals currently being built. Although the government claims they are for irrigation purposes, all the evidence we have points to them being the first steps for major transfers out of the Ebro basin. Furthermore, European legislation, via the Water Framework Directive, insists that the Spanish government must now assign a “minimum” regime of environmental flows for the Ebro. At present it seems that the government is more interested in sharing out what little water the Ebro has for irrational intensive agricultural projects and industry, before assigning this necessary protection for the river. The current version of the Ebro River Basin Management Plan the Spanish government has presented confirms our fears. For specific information in English about the PDE or any of our activities please send a mail to plataformadefensaebre@gmail.com (with “English info request” as the subject). Alternatively you can click on the automatic translation service installed on the right-hand side of the blog for quick translations of any post.